Globe artichokes are perennial members of the thistle family, with blue-grey leaves and growing over a metre in height. They are grown for the greenish purple flower buds which have fleshy, edible parts at the base of the flower scales at the top of the flower stem. The hearts are cooked or pickled. Globe artichokes grow best in cool climates, at 13 -18oC, and can tolerate light to medium frosts. They are normally propagated by division, using handforks, spade or sharp knife to divide healthy plants in spring. Each piece should have at least two shoots, a strong root system and should be planted 60-75cm apart. They can be raised from seed either in the greenhouse or outside with variable results. Divide only productive plants and replace every three years or so. The plants prefer an open but not exposed site, fertile, well-drained soil, with the benefit of well rotted compost or manure dug in. The bed must be kept weed free and the soil mulched to reduce water loss in summer and waterlogging must be avoided in winter. Earth up the crowns and cover with straw if severe frost is expected. 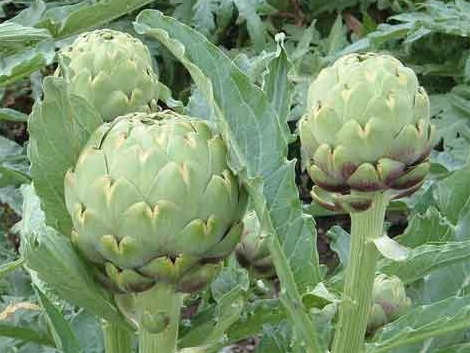 Globe artichokes do not appear to be affected by pests or disease. In the first season, some heads may be cut and more should be produced in the second year. Harvest before the scales open, when the buds are plump and cut off the hard scale tips with kitchen scissors before cooking.